Aix-en-Provence ([ɛksɑ̃pʁɔvɑ̃s]; Provençal Occitan: Ais de Provença in classical norm, or Ais de Prouvènço in Mistralian norm, [ˈajz de pʀuˈvɛⁿsɔ], Latin: Aquae Sextiae), or simply Aix ([ɛks]; medieval Occitan Aics), is a city-commune in the south of France, about 30 km (19 mi) north of Marseille. A former capital of Provence, it is in the region of Provence-Alpes-Côte d'Azur, in the department of Bouches-du-Rhône, of which it is a subprefecture. The population of Aix numbers approximately 143,000. Its inhabitants are called Aixois or, less commonly, Aquisextains. In the 4th century AD it became the metropolis of Narbonensis Secunda. It was occupied by the Visigoths in 477. In the succeeding century, the town was repeatedly plundered by the Franks and Lombards, and was occupied by the Saracens in 731 and by Charles Martel in 737. Aix, which during the Middle Ages was the capital of Provence, did not reach its zenith until after the 12th century, when, under the houses of Barcelona/Aragon and Anjou, it became an artistic centre and seat of learning. Aix passed to the crown of France with the rest of Provence in 1487, and in 1501 Louis XII established there the parliament of Provence, which existed until 1789. 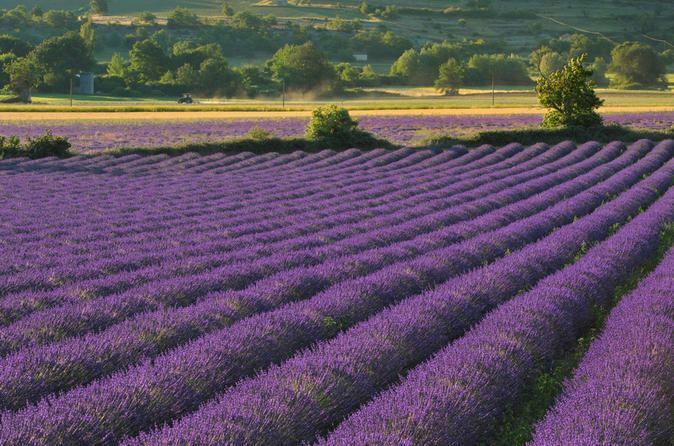 In the 17th and 18th centuries, the town was the seat of the Intendance of Provence. Aix-en-Provence is situated in a plain overlooking the Arc, about a mile from the right bank of the river. The city slopes gently from north to south and the Montagne Sainte-Victoire can easily be seen to the east. Aix's position in the south of France gives it a warm climate, though more extreme than Marseille due to the inland location. It has an average January temperature of 5 °C (41 °F) and a July average of 23 °C (73 °F). It has an average of 300 days of sunshine and only 91 days of rain. While it is partially protected from the Mistral, Aix still occasionally experiences the cooler and gusty conditions it brings. Unlike most of France which has an oceanic climate, Aix-en-Provence has a Mediterranean climate. The Cours Mirabeau is a wide thoroughfare, planted with double rows of plane trees, bordered by fine houses and decorated by fountains. It follows the line of the old city wall, and divides the town into two sections. The new town extends to the south and west; the old town, with its narrow, irregular streets and its old mansions dating from the 16th, 17th and 18th centuries, lies to the north. 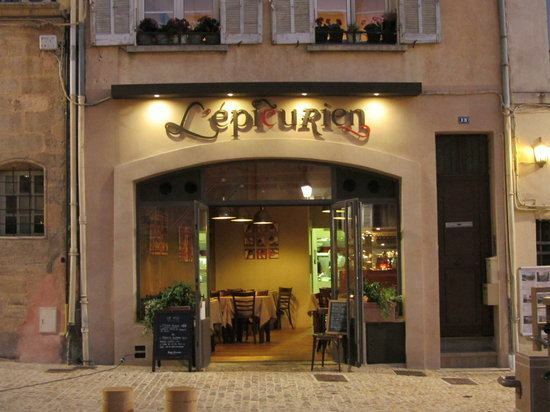 Situated on this avenue, which is lined on one side with banks and on the other with cafés, is the Deux Garçons, the most famous brasserie in Aix. Built in 1792, it was frequented by the likes of Paul Cézanne, Émile Zola and Ernest Hemingway. The Cathedral of the Holy Saviour (Aix Cathedral) is situated to the north in the medieval part of Aix. Built on the site of a former Roman forum and an adjacent basilica, it contains a mixture of all styles from the 5th to the 17th century, including a richly decorated portal in the Gothic style with doors elaborately carved in walnut. The interior contains 16th-century tapestries, a 15th-century triptych, depicting King René and his wife on the side panels, as well as a Merovingian baptistery, its Renaissance dome supported by original Roman columns. The archbishop's palace (Palais de l'Archêveché) and a Romanesque cloister adjoin the cathedral on its south side. The Archbishopric of Aix is now shared with Arles. 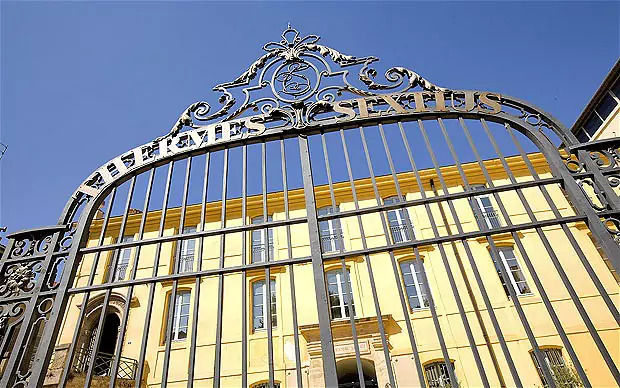 Among its other public institutions, Aix also has the second most important Appeal Court (Palais de Justice) outside of Paris, located near the site of the former Palace of the Counts (Palais des Comtes) of Provence. The Hôtel de Ville, a building in the classical style of the middle of the 17th century, looks onto a picturesque square (place de l'Hôtel de Ville). It contains some fine woodwork and tapestries. At its side rises a handsome clock-tower erected in 1510. Also on the Place de l'Hôtel de Ville is the former Corn Exchange (1759–1761) (Halle de Grains). This ornately decorated 18th-century building was designed by the Vallon brothers. Nearby are the remarkable thermal springs, containing lime and carbonic acid, that first drew the Romans to Aix and gave it the name Aquae Sextiae. A spa was built in 1705 near the remains of the ancient Roman baths of Sextius. South of the Cours Mirabeau is the Quartier Mazarin. This residential district was constructed for the gentry of Aix by Archbishop Michele Mazzarino brother of Cardinal Jules Mazarin in the last half of the 17th century and contains several notable hôtels particuliers. The 13th-century church of Saint-Jean-de-Malte contains valuable pictures and a recently restored organ. Next to it is the Musée Granet, devoted to European painting and sculpture. Aix is often referred to as the city of a thousand fountains. 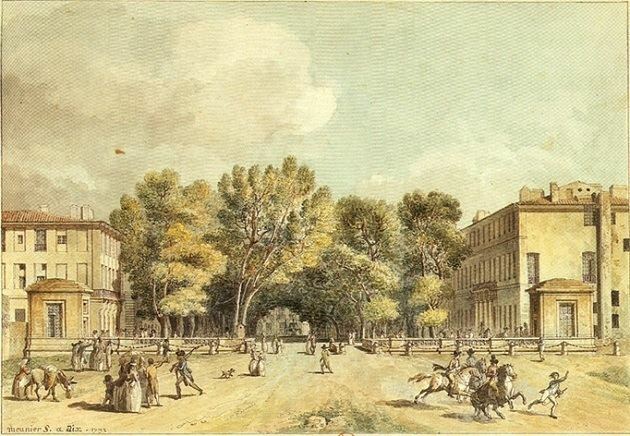 Among the most notable are the 17th-century Fontaine des Quatre Dauphins (Fountain of the Four Dolphins) in the Quartier Mazarin, designed by Jean-Claude Rambot, and three of the fountains down the central Cours Mirabeau: At the top, a 19th-century fountain depicts the "good king" René holding the Muscat grapes that he introduced to Provence in the 15th century; halfway down is a natural hot water fountain (34 °C), covered in moss, dating back to the Romans; and at the bottom at la Rotonde, the hub of modern Aix, stands a monumental fountain from 1860 beneath three giant statues representing art, justice and agriculture. In the older part of Aix, there are also fountains of note in the Place d'Albertas and the Place des Trois-Ormeaux. Arts et Métiers ParisTech, an engineering graduate school that settled a campus in the city in 1843. This teaching and research center (CER) let the students attend courses focused on industrial and mechanical engineering. Université de Provence Aix-Marseille I, specialising in the humanities. Université de la Méditerranée Aix-Marseille II, specialising in economics. Université Paul Cézanne Aix-Marseille III, specialising principally in law, economics, political science and administration. Institut de l'Aménagement Régional, an institute in the Université Paul Cézanne for town and country planning. Lycée George Duby, an international secondary in Luynes, on the outskirts of Aix, taking a large number of English-speaking students. IAU College, a not-for-profit study abroad institute for American students with programs in art, art history, business, communication, French language and culture, international relations, psychology and many others. Offers internships and homestays. Val Saint André, a private school in the east of Aix that teaches English IGCSE and A-level examinations as well as the French Baccalaureate. An important opera festival, the Festival international d'Art Lyrique, founded in 1948, now ranks with those in Bayreuth, Salzburg and Glyndebourne. The current director is Bernard Foccroulle, director of la Monnaie in Brussels. The festival takes place in late June and July each year. The main venues in Aix itself are the outdoor Théâtre de l'Archévêché in the former garden of the archbishop's palace, the recently restored 18th-century Théâtre du Jeu de Paume, and the newly built Grand Théâtre de Provence; operas are also staged in the outdoor Théâtre du Grand Saint-Jean outside Aix. Linked to the festival is the Académie européenne de musique, a summer school for young musicians with master classes by celebrated artists. Over the four-year period from 2006 until 2009, Sir Simon Rattle's version of Wagner's Ring Cycle with the Berlin Philharmonic was performed at the Aix festival. This takes place each year in June to coincide with the national 'Fête de la Musique.' There is a week of classical, jazz and popular concerts held in different street venues and courtyards in the city. Some of these events are held in the Conservatoire Darius Milhaud, named in honour of the French composer, a native of Aix. The dance company Ballet Preljocaj of the French dancer and choreographer Angelin Preljocaj has been located in Aix since 1996. In 2007 it took up residence in the Pavillon Noir, a centre for dance performance, designed in 1999 by the architect Rudy Ricciotti. The centre is one of nineteen of its kind in France, designated Centre chorégraphique national. Aix-en-Provence was part of Marseille-Provence 2013, the year-long cultural festival when the region served as the European Capital of Culture. Aix hosted several major cultural events including one half of the Grand Atelier du Midi gala exhibition and an episode of the Révélations pyrotechnical performance. The city also unveiled major new cultural infrastructure to coincide with Marseille-Provence 2013, including the Darius Milhaud Conservatory designed by Kengo Kuma. Le Musée du Vieil Aix (Museum of Old Aix), housed in two period "hôtels particuliers" and devoted to the history and provencal heritage of Aix. Le Muséum d’Histoire Naturelle (Natural History Museum). Le Musée de Tapisseries (Tapestry Museum), housed in the Archbishop's Palace and with a collection of tapestries and furniture from the 17th and 18th centuries. Le Musée Paul Arbaud (Faïence/Pottery). Le Musée Granet, a museum devoted to painting, sculpture and the archeology of Aix. It recently underwent significant restoration and reorganization, prior to the international exhibition in 2006 marking the centenary of Cézanne's death. Due to lack of space, the large archeological collection, including many recent discoveries, will be displayed in a new museum, still in the planning stages. The museum contains major paintings by Jean-Dominique Ingres (among which the monumental "Jupiter and Thetis"), an authentic self-portrait by Rembrandt and works by Anthony van Dyck, Paul Cézanne, Alberto Giacometti and Nicolas de Staël. In June 2011, the first part of the collection of the Fondation Jean et Suzanne Planque opened at the Musée Granet, containing over 180 artworks. This legacy of the Swiss painter, dealer and art collector Jean Planque, a personal friend of Pablo Picasso, has been donated to the city for an initial period of 15 years. The collection contains over 300 works of art, including paintings and drawings by Degas, Renoir. Gauguin, Monet, Cézanne, Van Gogh, Picasso, Pierre Bonnard, Paul Klee, Fernand Léger, Giacometti and Dubuffet. The full collection will be housed in a specially constructed annex in the Chapelle des Pénitents Blancs, situated nearby: the expected opening is in 2013. Le Pavillon de Vendôme, a 17th-century mansion housing permanent and touring art exhibitions. The Vasarely Foundation a gallery dedicated to the works of the Hungarian-born French abstract painter Victor Vasarely. L'atelier Cézanne, the former studio of Paul Cézanne, now a museum, located in the northern outskirts of Aix. It has been preserved as it was at the time of the painter's death and contains many of his personal items and props used in his paintings. Jas de Bouffan, the house and grounds of Cézanne's father, now partially open to the public. Prior to 1989 Aix had several libraries, for example in the Parc Jourdan and the Town Hall. In 1989, many of these were moved to the Méjanes, an old match factory. In 1993, the "Cité du Livre" was opened around the library. This has media spaces for dance, cinema and music, and a training facility for librarians. Adjacent to the Cité du Livre are the Grand Théâtre de Provence and the Pavillon Noir (see above). To the east of Aix rises the Montagne Sainte-Victoire (1011 m), one of the landmarks of the Pays d'Aix. It is accessible from the centre of Aix by road or on foot, taking the wooded footpath of Escrachou Pevou to the plateau of Bibemus. It dramatically overshadows the small dam built by Émile Zola's father and was a favourite subject and haunt of Paul Cézanne throughout his lifetime. In the village of le Tholonet on the precipitous southern side of Mont Sainte-Victoire, there is a windmill that he used and beyond that a mountain hut, the refuge Cézanne, where he liked to paint. To the north, the mountain slopes gently down through woodland to the village of Vauvenargues. The Château of Vauvenargues overlooking the village was formerly occupied by the Counts of Provence (including René of Anjou) and the Archbishops of Aix before it became the family home of the marquis de Vauvenargues. It was acquired by the Spanish artist Pablo Picasso in 1958, who was resident there from 1959 until 1962, when he moved to Mougins. He and his wife Jacqueline are buried in its grounds, which are not usually open to the public. From 2009 onwards, the château, which now belongs to Jacqueline's daughter Catherine Hutin, has been open to the public from June to September. Mont Sainte-Victoire has a complex network of paths, leading to the priory and Croix de Provence at the summit, to the large man-made reservoir of Bimont and to the Roman viaduct above le Tholonet. Rugby union club Provence Rugby (previously Aix Rugby Club and Pays d'Aix Rugby Club) is based in the city. As of 2016/7, they play in Fédérale 1, the second-tier French league. Former world number one squash player Grégory Gaultier lives in Aix-en-Provence. The city hosted Ukraine's football base camp during Euro 2016. Entertainment, particularly opera and dance. The semiconductor and electronics industry in Rousset, to the south of Mont St Victoire, specializing in microchip technology for credit cards. Education and research. 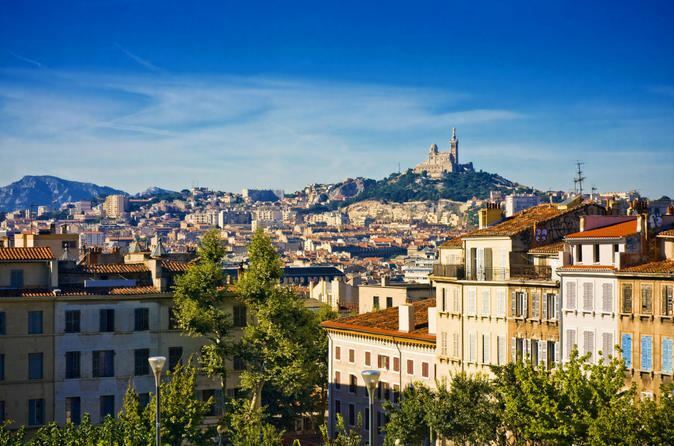 In Aix the University of Aix-Marseille specializes in the humanities, law and economics. The manufacture of santons, traditional hand-crafted figurines, often associated with provencal Christmas creches. The manufacture of olive oil. The manufacture of calissons, a lozenge-shaped confection made from almonds and crystallised melon. Each year in early September, there is a mass in French and Provençal in the medieval church of St Jean de Malte to bless the calissons – la bénédiction des calissons. This ceremony has been held since the 17th century to mark the deliverance of Aix from the plague. It is currently accompanied by a colourful provencal pageant, involving most of the local calisson manufacturers and their wares. Viticulture: the local Appellation d'Origine Contrôlée is Coteaux d'Aix-en-Provence AOC, with many vineyards between Aix and the River Durance to the north. The reputed appellation of Palette AOC is represented by the estates of Château Simone in Meyreuil and Château Crémade in Le Tholonet, to the east of Aix. There is a fair of local wine producers every year on the last Sunday in July on the Cours Mirabeau. Grape varieties include grenache, syrah, cabernet sauvignon, and notably vermentino. Chocolate: the well known Chocolaterie de Puyricard is situated in the hills to the north of Aix. The airline Twin Jet has its head office in Aix-en-Provence. A set of ancient roads radiate out from Aix to the surrounding countryside, the Pays d'Aix. There are also a large number of modern autoroutes connecting Aix to nearby towns. There are autoroutes northwards to Avignon and to the Luberon; southwards to Marseille; and eastwards to Aubagne and the Mediterranean coast of Provence; and to Nice and other towns on the French Riviera. Aix and Marseille are equidistant from the Marseille Provence Airport (MRS) at Marignane on the Etang de Berre which features domestic and international scheduled passenger service. There is another airport at Les Milles, which is mostly used by general aviation. There is a frequent bus shuttle service from the main bus station in Aix which also serves the nearby TGV station at l'Arbois, in the middle of the countryside about 10 miles (16 km) from Aix. At Aix, the line from Paris branches to Marseille and Nice; it takes about 3 hours to get from Paris to Aix by TGV. Aix also has a railway station near the centre, Gare d'Aix-en-Provence, with connections to Marseille, Pertuis and Briançon in the French Alps. A frequent and rapid shuttle bus service for commuters operates between the bus station in Aix and Marseille. There are many other long distance and local buses from the bus station. In the town itself, there is an inexpensive municipal bus service, including a dial-a-bus service ("proxibus"), a park-and-ride service and tiny electrified buses for those with mobility problems. Those are six seater vehicles that circulate at a speed of 10 mph (16.09 km/h). 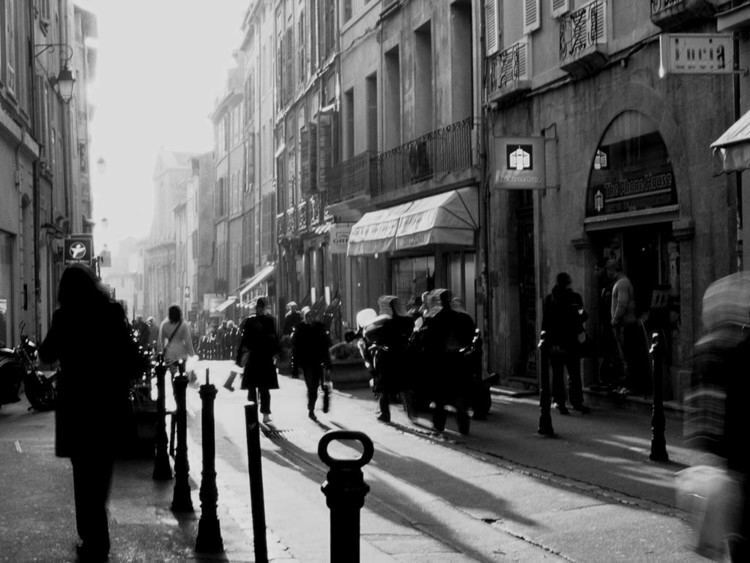 The central old town of Aix is for the most part pedestrianised. There are large underground and overground parking structures placed at regular intervals on the "boulevard exterieur", the predominantly one-way ring road that encircles the old town. Access to the old town is by a series of often narrow one-way streets that can be confusing to navigate for the uninitiated. As in many other French cities, a short-term bicycle hire scheme nicknamed V'Hello, free for trips of less than half an hour, has recently been put in place by the town council: and has been popular with tourists. As well as overland routes, two "rivers" flow through Aix, the Arc and the Torse, but neither of which can remotely be described as navigable. The local Aix dialect, rarely used and spoken by a rapidly decreasing number of people, is part of the provencal dialect of the Occitan language. The provencal for "Aix-en-Provence" is "Ais de Prouvènço" [ˈaj de pʀuˈvɛ̃sɔ]. Most of the older streets in Aix have names in both Provençal and French. Aix hosted the ninth International Congress of Modern Architecture in 1953. Aix is the home town of the rugby union team Provence Rugby. It played host to the All Blacks during the early stages of the 2007 Rugby World Cup. Ysabel, the tenth novel of the best-selling Canadian author Guy Gavriel Kay, was set and written in Aix. Italian electroacoustic artist Giuseppe Ielasi's album Aix was produced in Aix-en-Provence, hence the title. This is also the site of an alleged sighting and landing of a UFO in 1981 that is taken seriously by GEIPAN, the department within the French Space Agency responsible for investigating aerospace phenomena. Jean de Dieu-Raymond de Cucé de Boisgelin (1732–1804), Archbishop of Aix. Nina Simone, (1933-2003), American singer, songwriter, pianist, civil rights activist, lived in Aix-en-Provence from 1993 for the remainder of her life.